India and Pakistan had been at war, covertly or overtly, since the latter was carved out of the Indian subcontinent on the 14th August 1947. Kashmir has been a major bone of contention between these two states, and three major wars have been fought over the Kashmir region. The Indo-Pakistani war of 1965 was the most decisive of all the wars fought between the two countries. It started in the month of August and lasted until 23rd September 1965. The major portion of the armor and weaponry used by both countries was provided by the Americans, Russians and British who were getting rid of older equipment used in WW2. 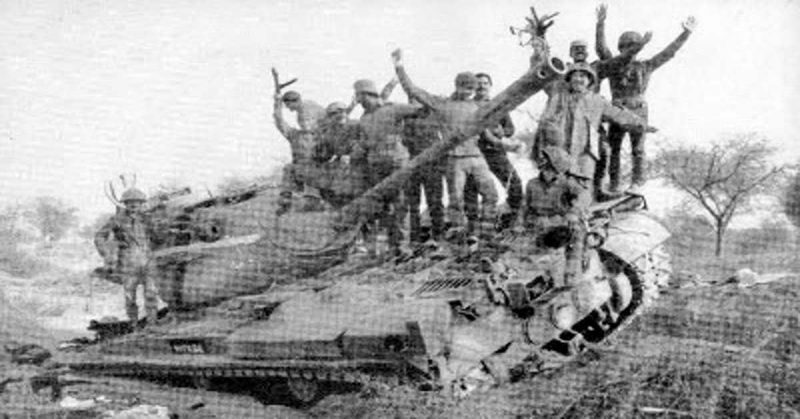 The Battle of Chawinda was one of the major battles fought during this war and is now hailed as one of the largest tank battles since the Battle of Kursk in WWII. The City of Sialkot in Pakistan was one of the cities which the Indians had planned to use as a base for further operations within Pakistan, once captured. The town of Chawinda lies a few miles from the main city and was the center of the action. General Dunn was the commander of the I Corps-Indian Army and was put in charge of an armored division, a mountain division, and 2 other divisions. The strength of the Indian forces ranged from 80,000 to 150,000 infantry and 230 tanks that consisted of both Centurions and Shermans. On the other hand, the Pakistani force that planned to repulse the attack initially consisted of an armored, an infantry and an artillery division. Later during the battle, reinforcements arrived, including another infantry division and another armored division. The Pakistani side consisted of 30,000 to 50,000 infantry, 132 tanks who were tasked with the initial defense and 150 reinforcements who retreated from the nearby tank battle of Phillora without many losses. Both Sherman and Patton tanks took part in at the battle. On 7th September, Indian forces consisting of 1st Armored Division, 14th Infantry, and 6th Mountain took control of the border area planning to cut off Pakistan’s supply lines. Following this, a short skirmish between the two took place which resulted in Pakistan losing 10 of its tanks. India had established its dominion over the Sialkot railway. Realizing the magnitude of the situation, the Pakistanis ordered two regiments of the 6th Armored Division to aid the 7th Infantry Division currently repulsing Indian attacks. In addition, an independent Tank Destroyer Squadron was put to action, amounting to 135 tanks. There were 24 M47 & M48 Pattons as well as some Shermans. Anticipating the movements of the Pakistani 6th Armored Division, the Indian forces planned to drive a wedge between Sialkot and the Division. All was in India’s favor as the Pakistanis only had a single regiment at that time – even though the order was for 2 to reach the city. The Indian 1st armored brigade was divided up and, along with the 43rd Lorried Infantry Brigade, advanced towards the Pakistanis. The main portion of the 1st Armored Brigade was sent towards the nearby town of Phillora. The tank battle that took place there was won by the Indian forces since the Pakistani regiments retreated after a few days of battle. The decision to retreat gave Pakistan a strategic edge as they successfully saved their armor from destruction. This worked in their favor at the main Battle of Chawinda. The Pakistanis also had a newly raised tank division commanded by newly trained young officers all with high morale. The Pakistani Airforce also managed to slow down the Indian advance at Phillora to some extent, but the Indian force was too large to be completely stopped. Soon enough the 25th Cavalry of the Pakistani Army saw approaching dust columns. On 10th September, the Indians resumed their attacks while engaging multiple corps and managed to push the Pakistanis back to defensive positions in Sialkot. The Pakistani position was perilous. All their counterattacks had been met with harsh resistance. The Indians outnumbered the Pakistanis 10 to 1. however, Pakistani reinforcements were on their way – another two divisions, one of infantry and one of tanks. The Pakistanis who were now settled at Chawinda were ready to go on the offensive, and every attack by the Indians was repulsed. By the morning of 14th September, the Pakistani 6th Armored Division organized under Colonel Wajahat was holding a pivotal location in the Chawinda region. The Indians had put their minds to work and it was clear they weren’t going to leave any stone unturned in capturing Chawinda. The Indian plan was to cut the supply route between the stationed forces and the central command, to surround the Pakistani forces as much as possible so that the thrust of the Pakistani armor never joined the smaller units of the Pakistani army, and to establish an attacking position from the captured town of Phillora. The Indian assault didn’t gain any momentum till late night when they captured a few nearby villages. 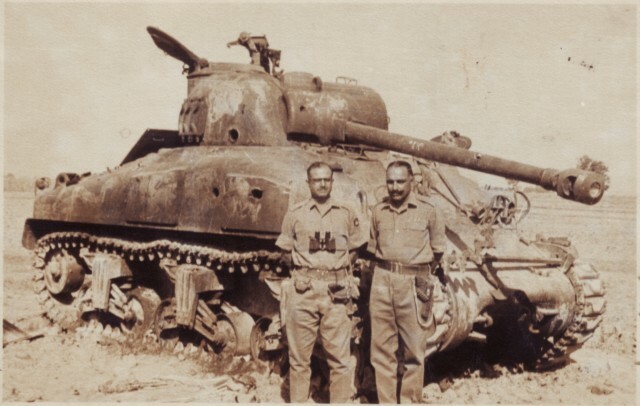 The Indian tanks consisting of 4 regiments tried to ram through the 3 Pakistani regiments but failed to do so due to the superior formations of the Pakistanis. There was utter chaos on the fields as the Pakistani Pattons engaged with Indian Centurions and Shermans. The Pakistani 25th Cavalry played a major part too, with shiny new armor and officers who were well versed in modern warfare tactics. The air force and artillery played less of a part of this engagement since the two sides had essentially mingled with each other. There were full frontal clashes between the two sides and only after a significant distance had been established between the two did the Pakistani artillery with its newly acquired US guns engaged the Indians, destroying much of the retreating Indian side. At the end of the day, the battlefield looked like a graveyard of tanks. But once again, the Indians regrouped. 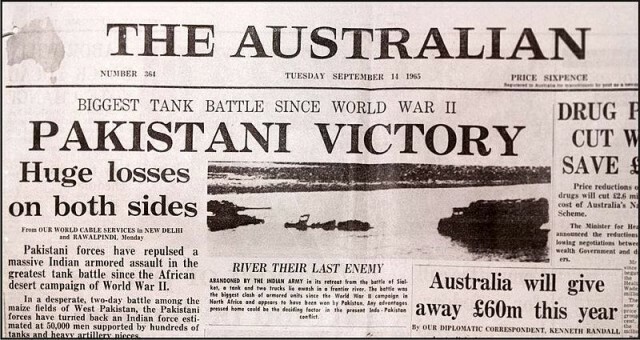 They weren’t ready to surrender just yet so they planned to outflank the Pakistanis on 16th September. This time, the Pakistani Artillery came in earlier and prevented the Indian advance completely. The Pakistani artillery was commanded by Shaukat Riza, who was excellent at making use of the resources he had. Even though the Indians had 6 artillery brigades, they managed to cover only 3000 yards in 15 hours. The infantry was scattered all along the line and every time they tried to regroup the Pakistani guns raged thunder on them with 90 artillery pieces including 12x 8-inch howitzers. On 21st September, the Indians withdrew back to their original defensive positions and all operations were ceased. The Pakistani Generals vetoed a counterattack against the Indians proposed by the officers on the field as they didn’t have a backup plan in place. In addition, foreign efforts to end the war had worked and on 22nd September, the UNSC passed a resolution demanding an unconditional ceasefire from both nations. Both the countries agreed to do so and the hostilities formally ended on 23rd September. The territories gained by both countries were returned after the Tashkent Declaration was signed by both countries sponsored by the Soviet Union. The victory of the battle was attributed to Pakistan as it gained equal leverage during the final peace deal, something that might not have happened, had the Pakistani Army been unable to defend their positions from the invasion.